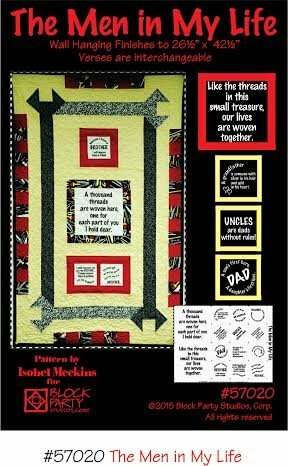 Show the men in your life how much you care with "The Men in My Life Pattern" that pairs perfectly with the panel of the same name! Quilt finishes 26 1/2" x 42 1/2". This item includes pattern and choice of white or natural "Men in My Life" panel of 100% Kona Cotton. Sayings on panel are interchangeable.